The Red Roof Inn is centrally located 4 miles from the New Hanover/Wilmington International Airport and 3 miles from downtown Wilmington. The hotel's amenities include complimentary parking, a complimentary deluxe continental breakfast, complimentary USA Today newspaper, an outdoor swimming pool, and valet service. 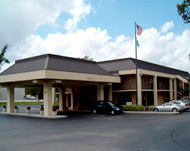 The Red Roof Inn is only a short drive to Wrightsville Beach and the University of North Carolina at Wilmington. All of the newly appointed, contemporary guest rooms have been carefully detailed and include individual climate control, work area with desk, coffee/tea maker with complimentary coffee/tea, remote control color TV with cable and HBO, mini bar, telephone with modem/data port connection, iron/ironing board, alarm clock radio, shower massage and hair dryer. Microwaves and mini-fridges are furnished upon request. Non-smoking and ADA approved guest rooms are available. The Red Roof Inn is only minutes from fine dining, shopping and entertainment venues.